Wishing for a round dining table that you can pick out all the features for? You've found it. The AAmish Custom Made Kenner Round Extension Dining Table is just the table. The beauty of Amish custom furniture is that there are numerous options to pick from to make a table that is uniquely yours and that's just right for your family. Round dining tables are said to be more social, everyone gathered can see each other and talk easily. This wood table is made in an Amish woodshop in Lancaster that has been crafting wood furniture since 1974. Pick your size with six to choose from. 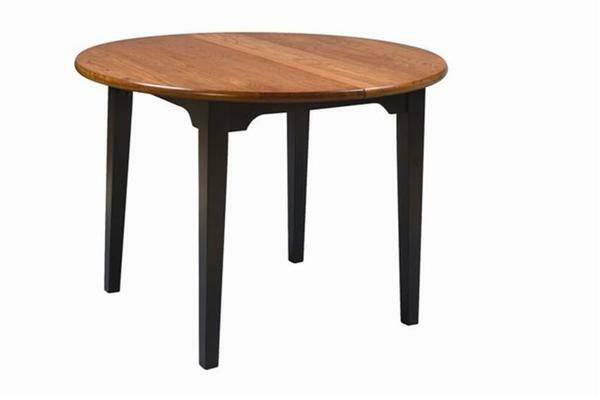 This round dining table comes in choice of oak, cherry or brown maple wood. Table extensions are available and each one measures 20" wide. Add up to two extensions. Extensions do not self store in the table. Pick table edge style and leg style from numerous options. This table is also available in 36" counter height. Choice of finish color and protective varnish. This table has wood slides which are the original table slide. They offer a simple style that will never rust and are strong and solid to support heavy weight. They offer a traditional look. Design your new dining table knowing it will last for generations. Please email or call a Furniture Specialist for assistance in customizing your new table. We can be reached by email at Questions@DutchCrafters.com or Toll-free at 866-272-6773. Width Between Legs at End: 22", Width Between Legs at Side: 22"
Tables have minimum skirt height of 25". Most arm chairs don't fit under the table skirt. 42" Diameter x 36" Counter Height Width Between Legs at End: 22", Width Between Legs at Side: 22"
48" Diameter x 30" Standard Height Width Between Legs at End: 26 1/2", Width Between Legs at Side: 26 1/2"
48" Diameter x 36" Counter Height Width Between Legs at End: 26 1/2", Width Between Legs at Side: 26 1/2"
54" Diameter x 30" Standard Height Width Between Legs at End: 29 1/2", Width Between Legs at Side: 29 1/2"
54" Diameter x 36" Counter Height Width Between Legs at End: 29 1/2", Width Between Legs at Side: 29 1/2"
Leg styles A, B, C, D, F, and J only are available on 36" Counter Height tables. Our dining room table arrived today, and it is just beautiful. Thank you so much for all your help. Garry, who delivered it, was the very definition of professionalism; I hope you'll continue to use his services in the future. We love our new table!